Chocolate Jasmine Truffles - Do You Know The Muffin Man? 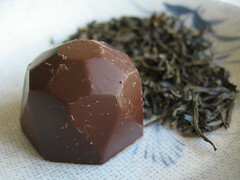 Notes: I followed the linked recipe and substituted good quality jasmine tea leaves, increasing the steeping time to 10 minutes, and reheating the cream before pouring over milk chocolate. I didn't want the strong flavour of bittersweet to overpower the delicate tea flavour. Even though I made these in a rush, the chocolates were well tempered, with a smooth finish, and released easily from the molds. I was doing some other baking at the time so leaving the bowl on a rack on top of the stove helped to hold the melted chocolate at 32°C. Most of the chocolates have a thin fracture around the circumference. My guess is that the tops are very thick, while the sides are thin. When you bite into one, they immediately burst around the edges. In terms of flavour, I'm disappointed. The jasmine-infused ganache was wonderful, but its aroma is quickly lost when it mingles with the bittersweet shells.